Chamarajanagar District and Taluks: Chamarajanagar is a town in the southern part of Karnataka, India. It is located on the highway linking the neighboring states Tamil Nadu and Kerala. It is the third least populous district of Karnataka. 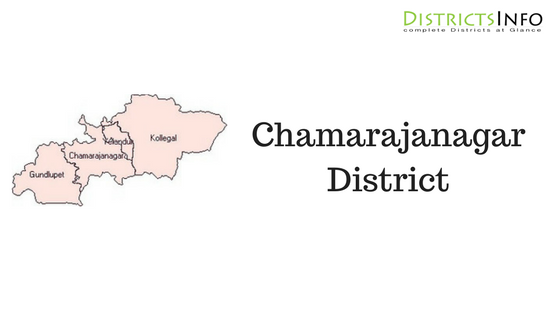 Chamarajanagar has an average elevation of 662 meters or 2,172 feet. As of the 2011 census, Chamrajanagar had a population of around one lakh. It has an average literacy rate of 60% which is higher than the national average. The literacy rate is almost around 60% in Chamarajanagar. Being the southernmost district of Karnataka, Chamarajanagar district borders the state of Tamil Nadu and Kerala. Specifically, it borders Mysuru district of Karnataka to the west and north, Mandya and Ramanagara districts of Karnataka to the north-east, Dharmapuri district of Tamil Nadu to the east, Salem and Erode districts of Tamil Nadu to the south- east, Nilgiris district of Tamil Nadu to the south and Wayanad district of Kerala to the south-west. Chamarajanagar railway station is the southernmost rail point in Karnataka. The nearest airport is Mysore airport and the nearest international airports are in Bengaluru and Coimbatore. Mostly in here, people speaks Kannada, Hindi, and English language. Kannada is the language of Karnataka. Since much of the southern area of the district is a dense forest, it provided good refuge to the bandits like Veerappan, who was responsible for the death of over a hundred policemen. Maaravva or Maaramma is most widely worshiped god in Chamarajanagar. More than ten temples of Maaravva can be found in the district. Chamarajeshwara Temple and Haralu Kote Anjaneya Temple are the biggest & the oldest temples respectively in Chamarajanagar. Chamarajanagar has more than 15 Mosques, 5 Churches, and 2 Jain Basadis & 2 Buddha Viharas. Overall this district Chamarajanagar is historically rich in cultural heritage and historical monuments.